Any angler would be lying if they said they’ve never dreamed about catching a monster fish, whether it’s a 10 pounder, a new PB, or even a state record. It’s a thought that has crossed all of our minds. 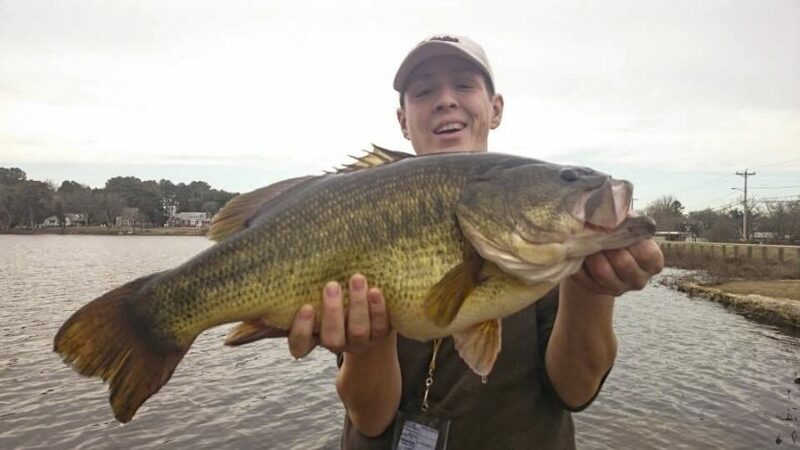 We’ve compiled a list of the State Largemouth Bass Record from all 50 states to help serve as a reference on the quality of fish swimming in your home state. Some records date back to George S Perry’s world record bass in 1922 while others state records seem to be broken every year. Either way, we all could literally be one cast away from from the bass fishing record books. Which is the most surprising state largemouth bass record to you? Having fished in Wisconsin for a while, I’m shocked the State Largemouth Bass Record is over 11 lbs, as I didn’t know double digit LMBs even existed there! Had a quick comment regarding the record for Wyoming. The record came from a stock pond on public land. Any fish caught in waters or fisheries not available to the public is ineligible for records. Just an FYI though, great post. The Arkansas state record is 16 pounds, 4 ounces, caught by Aaron Mardis from Mallard Lake, March 2, 1976. The fish on your list was illegal because the angler did not have a valid license at the time of the catch. RI record appears with previous record bass’ weight. New record weight is 11lbs 3.2 ounces. MN state record is 8-15, the one you have listed was broken in 2005. Did you guys do any research before putting this list together? Are we talking North America, South America or both?